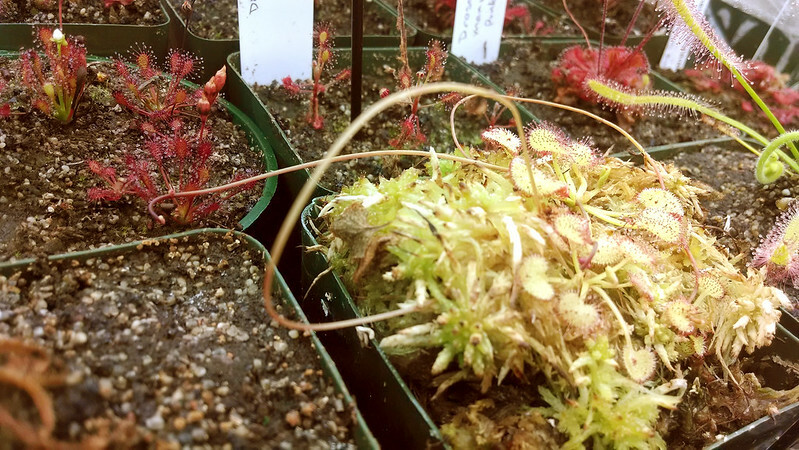 Drosera madagascariensis and other flower stalks |Sundews Etc. 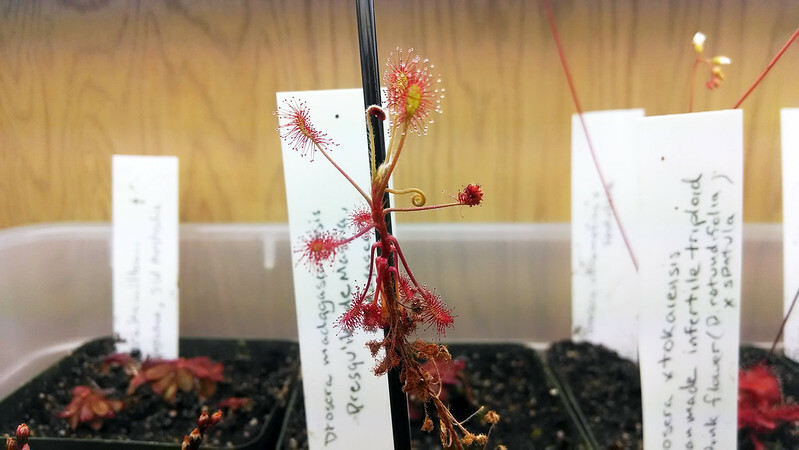 I was quite excited today to see that the largest Drosera madagascariensis I received from Not a Number during the NASC Auction has a flower stalk! Discovering surprises like this is one of my favorite things about having a collection of plants. 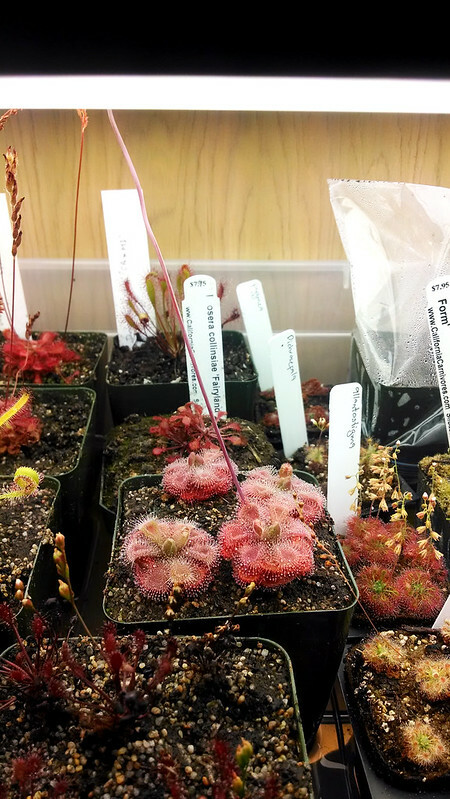 I love this species, and am super excited to start some seedlings in the next month or two. Better feed this plant well for the next few weeks so the seed sets nice and strong. The whole pot of them are looking nice. I'm using that cocktail straw as a bit of a stake for the plant as it grows lankier. There's also some madness going on nearby with my Drosera prolifera. Through the magic of false vivipary the one plant I received has already become 3 or 4, and there's another flower stalk on the way. I think these might like somewhat higher humidity, but they're certainly still growing well. 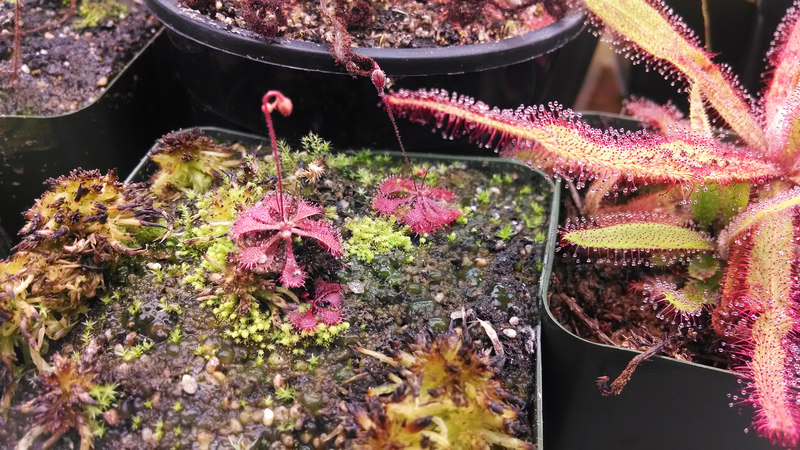 The mother plant has become more compact as well, probably due to my higher light conditions (this plant is being kept brighter than normal for its species). It's also trying to reach into other pots too! I should replace that peat:sand pot on the left with some LFS and start a new colony. 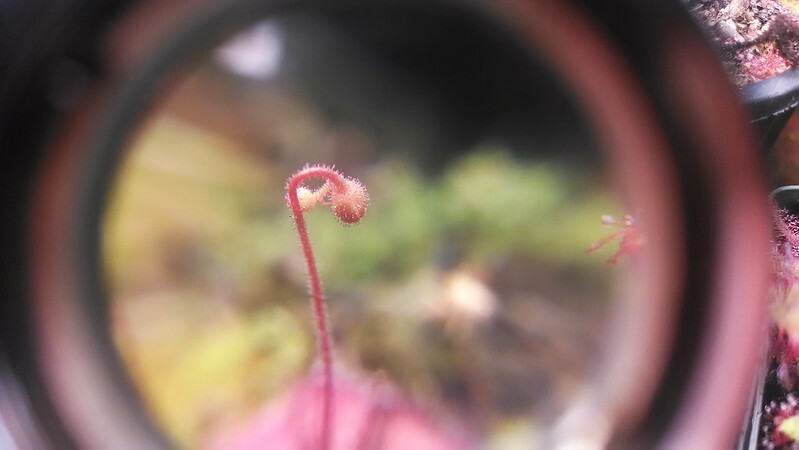 Every D. prolifera flower stalk produces a plantlet on the tip (thus the specific epithet "prolifera"), and the stalks stretch out horizontally, so they'll invade all your other pots. 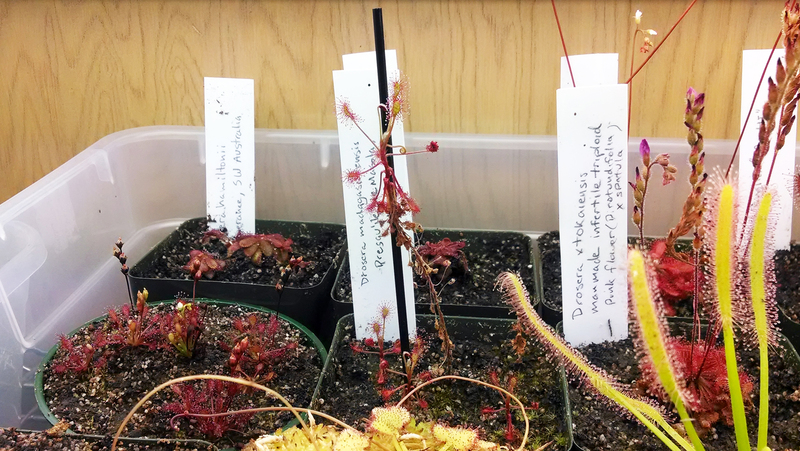 It makes propagation a total breeze though. Speaking of non-vertical flower stalks, I'm having to keep an eye on my Drosera burmannii. These four look like undersea creatures almost..
That flower stalk started out upright, but now it's leaning. There are still buds developing, so I don't want to clip it yet, but eventually it's going to be pushed all the way down by new growth. Got that peachy pink "just fed" color. 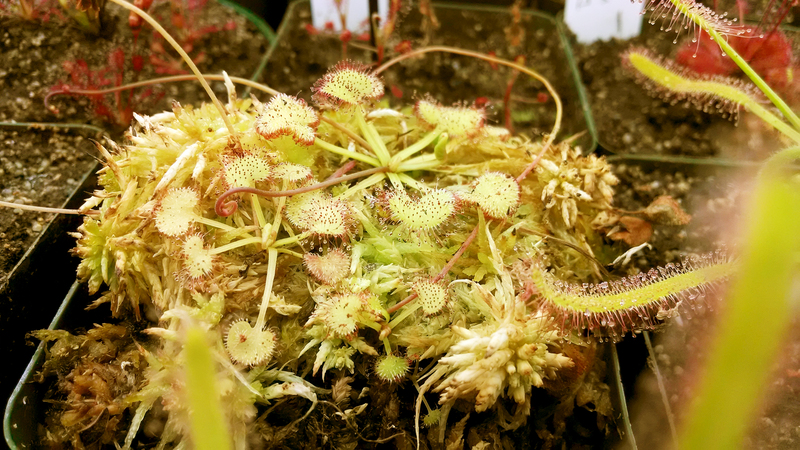 I don't want to lose a bunch of seed from it spilling out, and I certainly don't want a bunch of surprise D. burmannii popping up in my other pots, so I may just end up clipping it a bit early. This stalk is about 6 inches (15 cm) tall – the one of my largest specimen is twice that! I'm going to be swimming in D. burmannii seed pretty soon. On the total opposite side of the size spectrum, one of my Drosera brevifolia has sent up a stalk with two buds for the first time. I can't imagine seeking these tiny little guys out in the wild. Well done D. brevifolia. Well done. I usually get 10-12 seeds per bud, so it's been slow accumulating seed compared to my other plants. I suspect they might need cold stratification, but I'm not sure. Guess I can do some test germination to see. I also know some seed spilled into the pot, so if it germinates soon I guess we'll have our answer. 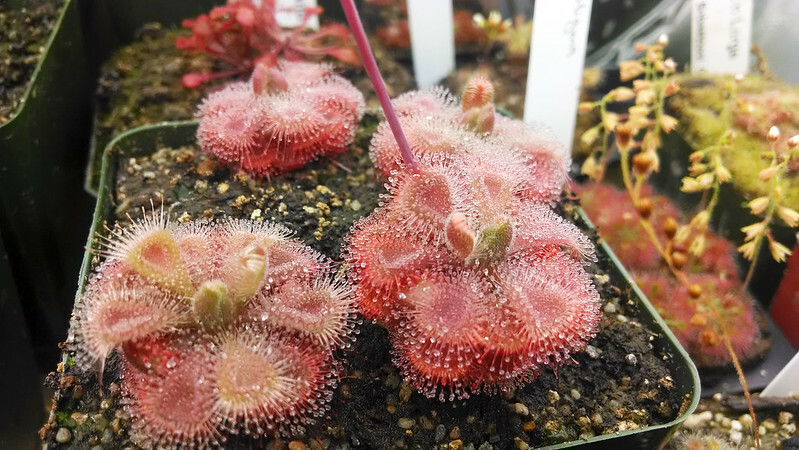 These are really fun, and are smaller than most of my pygmy sundews. It's my great dream to have lots of Drosera seed available to sell and trade and share. Getting closer! Looking great! Those plants are really thriving!